On November 25th, Fund of Women Entrepreneurs joined the international-information 16 days of campaign directed against gender violence. The action was widely covered by the central and local TV. Many citizens were interested in this event. On May 27, the beneficiaries of Fund of Women Entrepreneurs from Khoni, Kutaisi, Ozurgeti and Tskhaltubo took active participation in the silent action, organized to express support to the women candidates in local self-government elections. 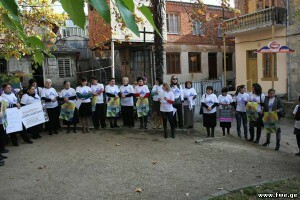 The silent action was conducted in fifteen cities of Georgia, which was coordinated by Fund “Sukhumi” in Western Georgia. “Equality is the power of the country” – with this slogan in the hand, the women attracted the public attention. There was mentioned, the action will get result – the women candidates will be elected. The action was illuminated by the local mass-media. On March 1-3 in the office of CTC in Tbilisi there was held a conference organized by the two international organizations-donors BfdW and EED. Participants of the Conference were 34 national NGOs from the countries of Southern Caucasus – Armenia, Azerbaijan, and Georgia. The topic of the conference: Process of merging of two organizations BfdW and EED and key issues regarding this merge. There was discussed perspective and visions of organizations for 2013. There were lectures as well as interactive work. Participants acquired not only new skills, but defined perspectives for future cooperation. Chairperson of Fund of Women-Entrepreneurs Meri Gelashvili and Chairperson of Fund “Sukhumi” Alla Gamakharia participated in the conference. On february 12, the representatives of Fund of Women Entrepreneurs visited the village Kurcha (bordering settlement of Abkhazia), where they met local activists. During the meeting, the long-term relations were initiated and decided that all measures will be conducted in Women Support Centre of Fund “Sukhumi”. 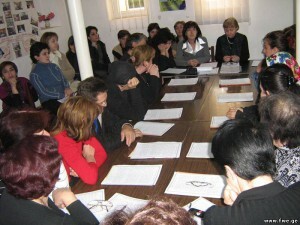 “Establishment of the League of Women entrepreneurs, opening of professional courses in Zestaponi, conducting of workshop for women entrepreneurs to familiarize them with the amendments in taxation legislation ” – these interesting proposals were sounded at the round table of Women Entrepreneurs Fund, where the women entrepreneurs and the students of professional course were invited. The meeting was dedicated to the international campaign “16 days of activism against violence against women”. The participants were provided with the information about the campaign and talked about the importance of economic strength to prevent violence. Fund of Women Entrepreneur organized a round table in Poti, in Women’s Support Centre of Fund “Sukhumi”. Purpose of the meeting: analyzing the activities of Fund of Women Entrepreneurs during the half year, the possibility of sharing information between the beneficiaries from Kutaisi and Poti, and outlining future plans. 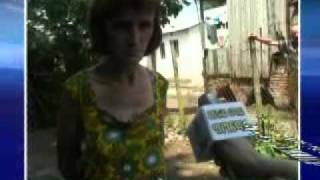 In the beginning, there was discussed the reasons to start working in Poti. One of the reasons is that a few non-governmental organizations work with IDPs in Poti, as well as the fact that the State program is intended to settle the IDPs from Tskhaltubo to Poti (in Maltakva). Therefore, it will be important that Fund of Women Entrepreneurs supported the women IDP in improving of economic conditions. Finally, once again, it was noted that the Fund initiative is welcomed to activate work with women IDPs, living in Poti. Conduction of the training has been planned in July on the basis of small business, accordingly creation of work places anticipated. The recommendations from the meeting participants have been considered and the courses in accounting will be organized since September in Poti. It is fact, that conducting of similar outdoor meetings and creating of the immediate environment facilitates the exchange of information, experience sharing among the beneficiaries, as well as between the organization and beneficiaries. Fund of Women Entrepreneurs conducted the roundtable to discuss the annual report of 2009 and action plan for 2010. The beneficiaries, an independent auditor and the representatives of local NGOs participated at the meeting with the main objective to make Fund’s activities transparent for its beneficiaries. At the beginning, the chairperson greeted the audience and introduced them with the agenda and purpose of gathering. After this, the narrative and financial reports were presented on the executed activities and expenditures during last year. The independent auditor presented the report and evaluated Fund’s activities with regard to financial point. There was mentioned that the vocational training courses, included in the Fund’s activities since 2009, has justified the expectation and therefore, they will continued this year too. While regarding the action plan of 2010, the beneficiaries stated very interesting recommendations: organizing of masterclasses for the women entrepreneurs who run similar businesses; conducting of trainings on basics of small business for those who have passed vocational training and etc. In this year, Fund of Women Entrepreneurs expands its working area and will start activities in POti and Khurcha (bordering village of Abkhazia). Fund of Women Entrepreneurs published the manual “Basis of Small Business Development”. There are a number of important issues discussed, such as organizational-legal forms of business, market research – marketing, management – business administration, financial management, elaboration of business-plans and etc. Practical examples on business-plans and the vocabulary for business person make the content of manual more interesting. The manual provides important assistance for the beginner entrepreneurs in developing their business-ideas. 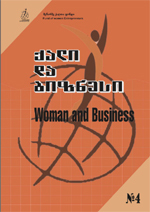 Fund of Women Entrepreneurs has released the fifth edition of the journal “Woman and Business”. The reader will find interesting material on the Fund’s activities. The extensive material is devoted to participation of organizations in the 16- day informational campaign against gender based violence. The reader learns that there was conducted a TV was, created 2 work places and held a round table that summarized the undertaken activities. future. The publication consists of 24 pages, available in Georgian and English languages. 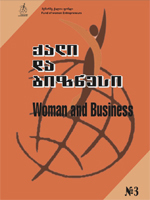 A new issue of the journal “Woman and Business” has been released. The article “Meeting in Poti” reflects the information about the roundtable meeting in Poti and the planned measures for future. From the other materials, published in the journal, the readers have opportunity to get acquainted with the training participants, work places that might be created in future and the small businesses of women in Khoni military settlement. Six-month reporting period is also covered by the journal. The lawyer provides the interesting information for the beginner entrepreneurs. On October 7th, the TV-channel “Mega-TV” transmitted the film of Fund of Women Entrepreneurs “The past way”. The film reflected the information about successful work places, created by Fund of Women Entrepreneurs within the project of EED. The film tells about how the women develop their businesses, how they achieved success, how much the profit is important for them, what are their plans for future. “My success is the merit of Fund of Women Entrepreneurs. Today, I serve almost seventy persons in the beauty saloon. This means that they are satisfied with the service. I hope that the number of customers will increase” – says Eka Bagaturia, a young woman from Abkhazia who lives in Zestaponi at present. 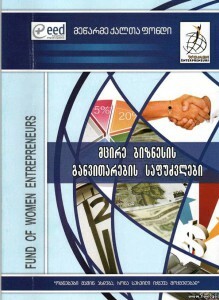 ”This manual is the ABC that gives to women entrepreneurs the initial knowledge and education for developing successful business” – said the composer and author of “Small Business Develpment Basis”, and Doctor of Economic Sciences, an Associated Professor Madona Gelashvili in the telecast of Fund of Women Entrepreneurs, transmitted by “Mega-TV” on April 16. “Small Business – a first step of women’s economic independence” – this is the topic of the telecast from the series “Women’s entrepreneurship – business or survival”. 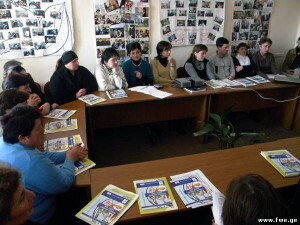 From the nine-minutes telecast, the population of Western Georgia had chance to get acquainted with the practical and concrete measures, carried out by Fund of Women Entrepreneurs at the beginning of 2010, including the information about sustainability of the work places created in Khoni. In the telecast, the participants of the youth business-training underlined their purposes and future plans. “Right choice will help in fulfilling our ideas” – they stated. The telecast of Fund of Women Entrepreneurs will be repeatedly transmitted by “Mega-TV” on April 20, at 18:00. 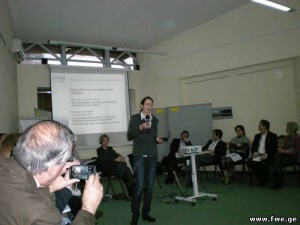 With the initiative of Centre for Strategic Research and Development of Georgia, the four-day training was conducted in Tbilisi on the topic of social entrepreneurship. 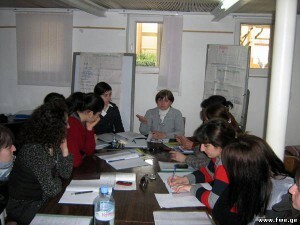 The representative of Fund of Women Entrepreneurs – Diana Kurashvili participated at the training. The training content was very well planned, including the most interesting issues of development of social entrepreneurship. There were identified the characteristics for social and profitable businesses. The experienced, gained at the training, will contribute to Fund of Women Entrepreneurs’ activities. With the initiative of Fund of Women Entrepreneurs, a new phase of vocational courses started in Kutaisi and Poti. Within the following three months, the trainees of English language, computer skills and accounting courses will have an opportunity to obtain useful knowledge. They express consent and consider that the gained experience will help them to build better future. In Poti, seventeen beneficiaries of the Fund of Women Entrepreneurs passed the vocational training course in English language and basis of computer skills. The main objective of these courses has been achieved: women IDPs have successfully demonstrated their capabilities and acquired the necessary skills. They are ready to use the obtained knowledge and realize their potential. On July 30th, the consultation meeting was held for the training participants in Poti to review their business-projects. The submitted projects coverer the scope of trade and services, as well as farming. The Competition Commission, after consideration of business plans, will take decisions and give preference to viable projects. Fund of Women Entrepreneurs conducted the next four-day training on the topic: “Basics of Small Business.” There participated the trainees of fund’s vocational training courses, as well as those women who expressed the interested. Among them were two Ossetian women. The main goal of training was to teach the participants the principles of small business and working independently on business-projects. All participants tried to be actively engaged in the work. Each of them expressed desire to participate in the competition and are ready to present their own business-projects within two weeks. After the training, the participants have the opportunity to receive consultation and additional information about the competition projects. To improve social conditions of women IDPs, living in Poti, was the main purpose of the first training-seminar conducted in this city on the topic “Small business basis”. As a result of this training, the examplary business-plans were worked out: one group and twelve individual. The training participants work hard and have consultations from Fund of Women Entrepreneurs for working on competitive projects (21-23 July ). The consultations have been conducted for the women, who passed the training in small business issues, arranged in April by Fund of Women Entrepreneurs. The consultation work, around the presented business-projects, lasted from April 29 to May. The training participants were greatly interested in different business fields for creating new work places. It was obvious, that the training stimulated the women to think on improving of their social-economic conditions, creating small business and trying their capacities. In consultation process, the women revealed purposefulness and came to the conclusion that a right choice will help them to realize their idea and achieve success in business activity. The training on small business issues was conducted for women IDPs from different collective centres of Kutaisi. There were invited new IDP women as well. The training thematic remains the same: small business concept, elaboration of business-plan, its structure and purpose, business organizational-legal forms, research of market – marketing, basic forms of bank credit and etc. The participants revealed interest and desire to discuss each topic detail, in order to use the obtained knowledge in elaborating sustainable business-projects and creating work places. 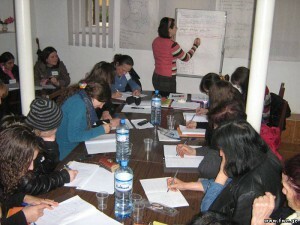 On March 22-25, Fund of Women Entrepreneurs conducted the business-training on the topic of “Small business basis”. The training was distinguishable from previous seminars by the fact that there participated the young women, who had passed the vocational courses in accounting, computer and English language courses, sewing and knitting. The participants had big desire to get acquainted with the small business basis, in order to make real choice on executable, sustainable business-projects and try their capacities in small business. The training thematic cover the following issues: small business concept, elaboration of business-plan, its structure and purpose, business organizational-legal forms, research of market – marketing, basic forms of bank credit and etc. At the completion of the training, each participant expressed desire of participating in the contest and, in the case of winning, developing of entrepreneurial activity successfully.